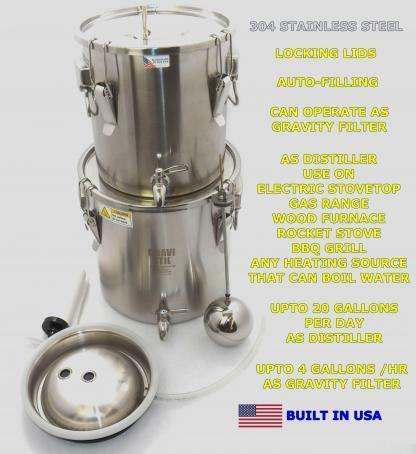 Stainless Steel non-electric Emergency Survival Water Distiller. 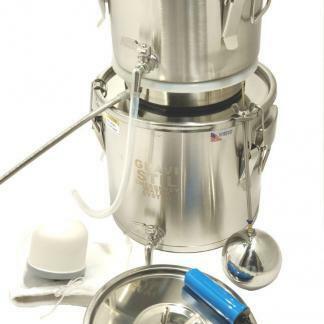 Desalinate Ocean Water, Distiller, Filter, and Sterilize all pathogens and removes salt from ocean water. System transforms from a Water Distiller into a gravity water filter system producing 4+ gallons of pure water per hour. 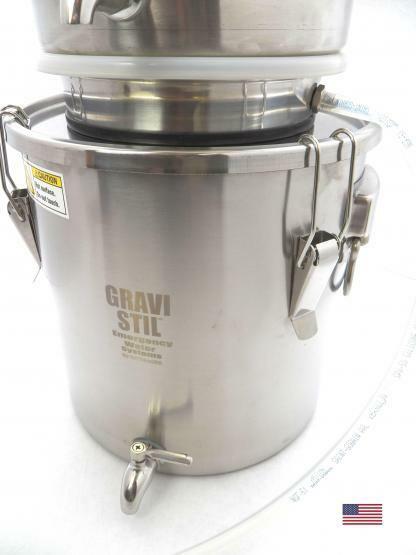 The Gravi-Stil Water distiller is a non electric water distiller that can save your life in an emergency or disaster. 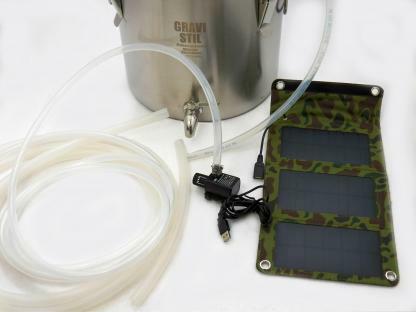 If power fails your gravi-stil can produce pure drinking water from ocean water source and fresh water supplies. 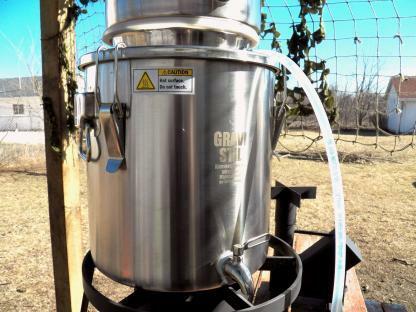 With hurricanes, earthquakes, tornadoes, natural and man made disasters alike, the gravi-stil can produce Pathogen free, Bacteria free and virus free water for you and your family. 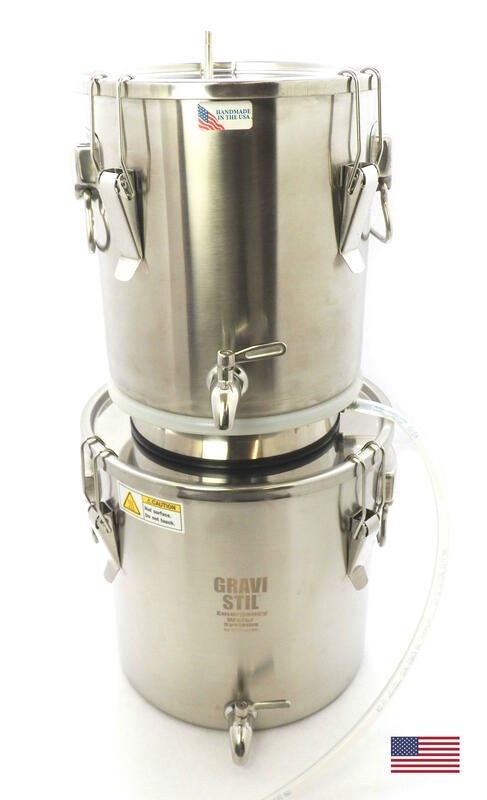 If you want the purest water possible from any water source our Gravi-Stil Emergency Water Distiller can perform. 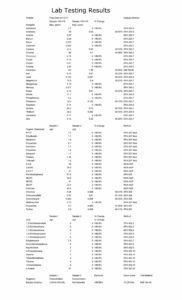 Most electric water distillers only make a gallon of water per batch and it takes 4+ hours to make 1 gallon, and uses upwards of 3000+ watts to produce 1 gallon. 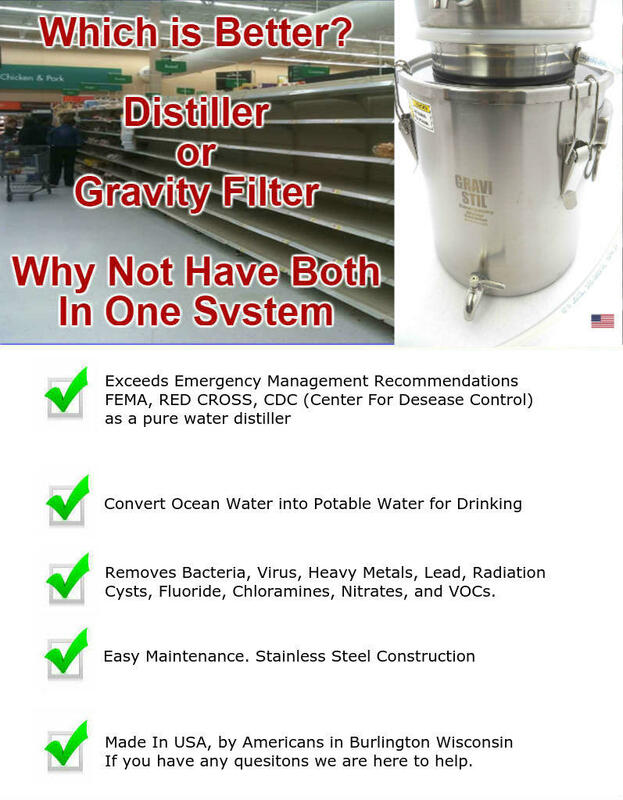 Also when power goes out, you cannot operate an electric water distiller to purify your contaminated tap water and you can’t use an electric water distiller to desalinate ocean water after a disaster. The Gravi-Stil Can Operate on Electric stoves, Gas Stoves, Propane Burners, barbeque grills, wood stoves, rocket stoves, and fire pits. The Gravi-Stil can produce up to 1 gallon of water per hour with our enhanced kit. 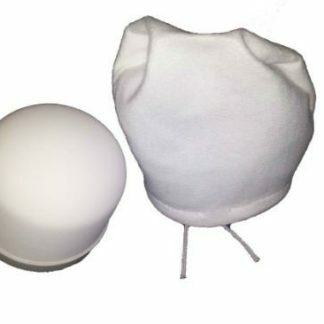 The pumps and filters require no electrical outlet to operate. 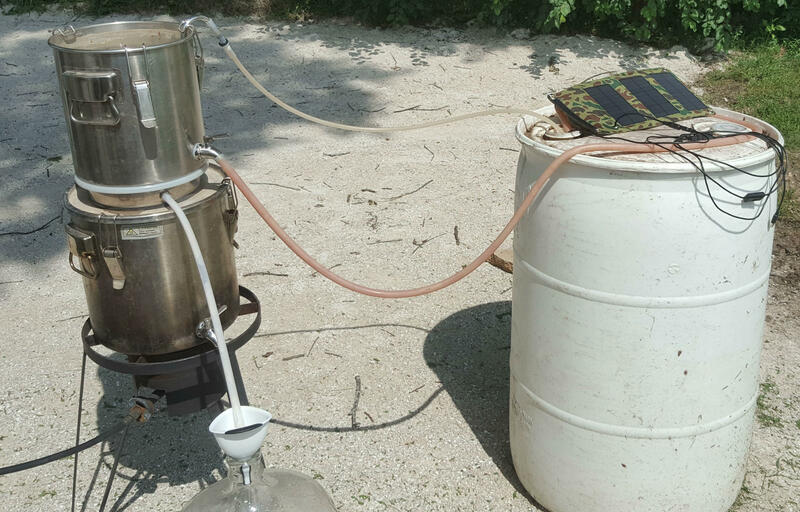 Just keep filling the top condenser pot on our distiller and it will continue to make pure, potable, drinking water. 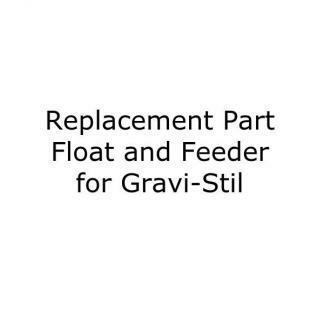 The GRAVI-STIL(tm) is the only system like it in the world. 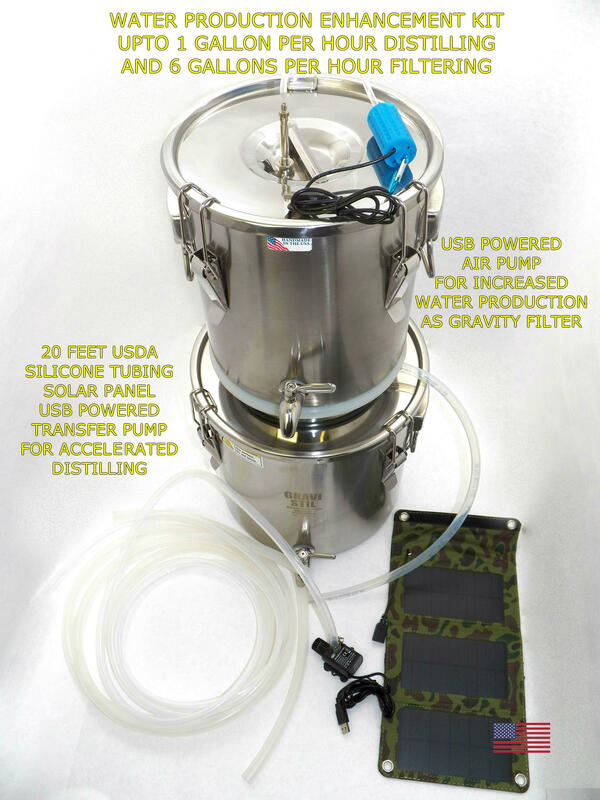 This unique water purification system can operate as a non-electric water distiller allowing you to purify ocean water, brackish water and fresh water sources. 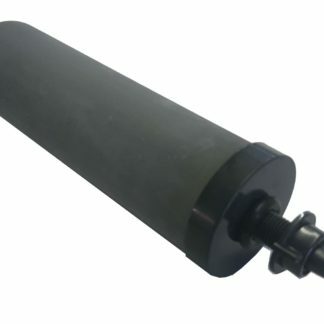 Then the system can convert into a large gravity water filter system in minutes and filter fresh water sources like Berkey(tm), Doulton(tm), Aqua Cera(tm) and many others. 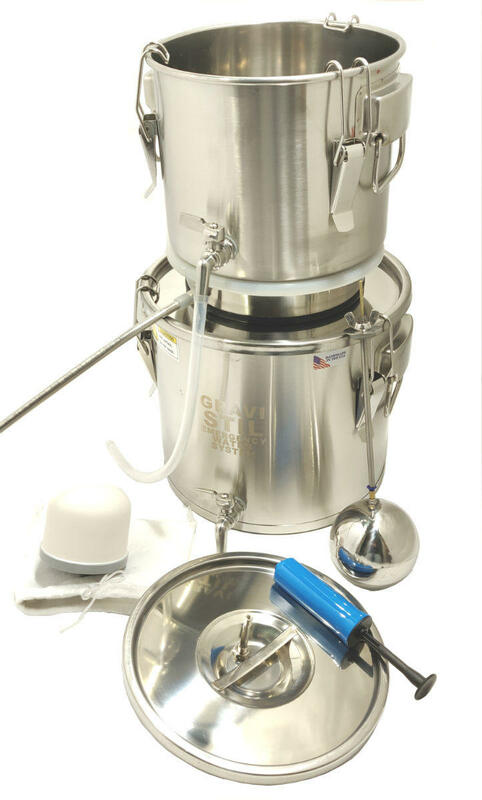 This system is capable of producing upto 10-12 cups of water per hour and upto 1+ gallons per hour with our optional enhancement kit. 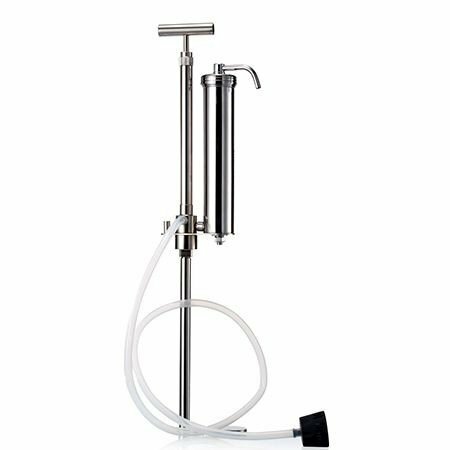 This system can purify upto 4 gallons per hour in gravity water filter mode with the included hand air pump. 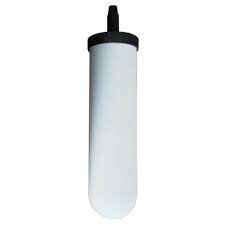 Removes Fluoride, Chlorine, Heavy Metals, Radioactive Particles, Bacteria, Viruses, Protozoa, Salt, Pesticides, and Nitrates. Auto-Fill feature allows user to continuously run distiller without refilling boiling pot. Automatically fills lower boiling pot with fresh water from condensing pot water. Just fill top pot and keep the distillation process going. OMG it works. What a great distiller. You guys are geniuses. American ingenuity at its best. My advice to everyone is buy the enhanced version. 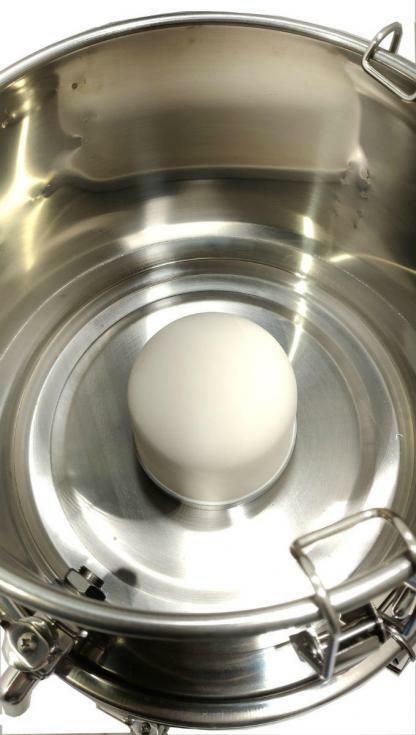 I just fill a large pot with water for the pump, and let it run. 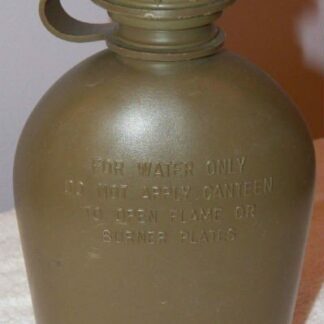 I make 1-2 gallons a night with stove burner on medium. Water tastes great. I only use the water filter, but I’m glad I can use the distiller if I ever need to. It is not as tall as my berkey system so It fits on my counter. thanks.